The Data Script functions of Mobile Data Studio are similar to the predecessor Pocket PC Creations software, and are accessed via the Data menu of the toolbar when a project is open. The 'PPCC' references are retained to respect the many previous deployments of Data Script in association with Pocket PC Creations. This is not necessary, but it can be helpful. Brief coverage of the Mobile Data Studio Object Model (Application, Project, Database, Session) follows. Examples of Data Script are provided below. If you require a customised Data Script for your integration and automation of Mobile Data Studio, please contact Mobile Technologies who can provide a commercial service. Beneath the Pages property is obviously a lot of project-design specifics, which if desired can be accessed to learn about the structure of a project, modify a project on the fly or even create a project from scratch (possibly based on a database table, etc). The PPCC.Database object is a collection of PPCC.Session objects, which represent sessions stored in the project. It can be enumerated or accessed by index. Also a new session can be created with the Add method. The other object that has been used in this example is the PPCC.Session object, which represents a stored project session (data). The Session object is similar to a dictionary, storing a set of key-value pairs that correspond to the ID names of points in the project. It has some other information properties (Date, LastSaved, Name, UnitID) which reflect where and when the session was created and modified. The keys can be accessed by index o.Key(1), as can the values, o.Value(1), up to o.Count. The more common way to look up values however is to index them by their key, for example if the project has a point named "Rank", then you could retrieve the value with o("Rank") or o.Item("Rank"). The session can also be iterated through, in which case it will return key/value pairs in the form "key=value" (strings). Sessions also have some methods that can be of use. The Save method commits changes to the session to the database, or adds the session to the database if it is not already in there. (You can tell if a session is in the database via the Archived property). The Clone method makes a copy of the session, with all data intact. The new session is of course not "archived", i.e. not in the database, although you could call its Save method to add it. You can also use the Delete method, which removes a session from the database. This has no effect if the session isn't in the database to begin with. The SendToClient method transmits a session over the TCP/IP wireless network to the specified client. The SendToLocal method sends the session to a locally connected Windows Mobile device. In some cases a more convenient way to program/script Mobile Data Studio for tasks is to write script directly in the Mobile Data Studio Data Script window. This avoids having to create a separate application in Access, SQL Server or VB, or another development environment. The Data Scripting facility allows Mobile Data Studio events to be handled by complex VBScript, to extend the functionality beyond what is offered in the normal processing pathways (which is limited to XML, HTML, ADO, Excel output and XML input). * OnIncomingSession is executed when a new project session (data) arrives from a mobile device, either via the ActiveSync cradle or via a wireless TCP/IP connection. The session is passed as an argument (for more information about the PPCC.Session object, see below). If this function returns True, normal processing proceeds (as specified in the Data Pathway dialog). If False, no further processing is performed. * OnIncomingSessionDeferred greatly speeds up the ability to deploy projects where the requirement is to run the Data Pathway prior to the Data Script, as it will allow the inbuilt features of the Data Pathway to be utilised before Script. The new Data Script Window in Mobile Data Studio version 9.0.8.0 is shown in the image below. An example of use of OnIncomingSessionDeferred is generation of a report in HTML via the Data Pathway and then distribution of the report using Data Script. * OnSourceSession is executed when a new XML input file is detected and processed. This applies only when XML input is enabled, for example when collaborating with Microsoft BizTalk server. Once again the session is passed as an argument, and returning True will allow default processing (as configured in XML Input options) to continue. * OnTelegram is executed when a telegram is received from a mobile device connected via TCP/IP. Telegrams can be used for real-time communication between the server and wireless mobile clients and are supported by the Telegram Point. * OnIdle is executed every few seconds, and is not passed any arguments. The script can use this opportunity to perform any tasks it wishes. A good example would be to query a database, or web data source, and transfer data into Mobile Data Studio project sessions for dispatch to mobile devices. Any scriptable COM objects can be used to perform these tasks, such as ADO for accessing data sources. There are several differences between working in the Data Script window and working from an external application. Both of the above methods will call the Project object's Synchronise method. Because the project is the default context, there is no need to type "Project." when accessing its members. 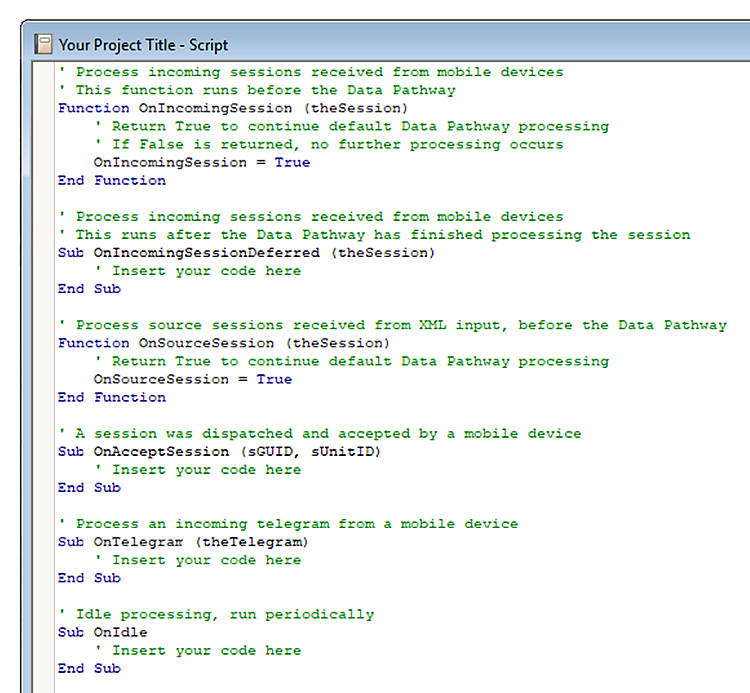 Similarly, when scripting within Mobile Data Studio, objects are often passed as arguments (such as the session object in the OnIncomingSession procedure). The Data Scripting functionality can be used to programmatically store information in a database, using ADO (rather than ODBC). Data scripting uses the VBScript language. Note: with image data the header may need to be removed by a 'GetDecodedItem' method; for example oRS("Image1") = theSession.GetDecodedItem("Image1").
' Create an ADO connection and open the database "C:\Access\Customer.mdb"
' Create a first recordset object and open a table called "NameOfTheFirstTable"
' Create a second recordset object and open a table called "NameOfTheSecondTable"
Note the special syntax for UnitID, as UnitID is a property of the telegram, rather than data in the telegram. t("PointName") = "New Point Value"
Note how the UnitID of the target mobile device is specified as an argument to the SendToClient method. This makes it possible to send telegrams upon any event. However in the common case that a telegram is being sent in response to one that was received, in the OnTelegram function, one would usually send the response telegram back to the same unit that sent the request. This code snippet will work with a simple project that contains one Telegram point, and a single Edit point named "PointName". file.WriteLine "Received a telegram from " & theTelegram.UnitID & ":"
And a specific example using the demonstration Telegram Text Test project (download) and Data Script below.
' This code demonstrates updating an existing row in a database when a ' telegram arrives with new information.
' Only respond to a particular TelegramName, "UpdateJob"
' Create an ADO connection and open the database "C:\Access\Jobs.mdb"
Set db = CreateObject( "ADODB.Connection" ) db.Open "Provider=Microsoft.Jet.OLEDB.4.0;Data Source=C:\Access\Jobs.mdb"
' NOTE: We could also send a reply telegram to the unit, supplying it with ' some fresh data from the database. Example for sending an email to confirm an order taken in the field using an email test Marketing Report project (download EmailTest.ppc , copy and modify Data Script below).
' email sending object often used in ASP websites. oMail.Subject = "Your Marketing Report Order"
JMail.Subject = "Your Marketing Report Order"
In some projects it is necessary to generate an output in data script based on the value of a point in the project. In this example, when processing via the Data Pathway, either "PASS" or "FAIL" is placed in a "Result" Edit point based on the value of a "ResultMath" Math point. Advanced COM objects, scripts and protocols have been included in the Data Script functions of Mobile Data Studio 7.3 (and carried into version 8.0) which can be applied in Data management. These advanced functions enable programmers to customise automation of processes; download details of the advanced COM objects, scripts and protocols.